Register for the 2nd student Cubesat workshop ! 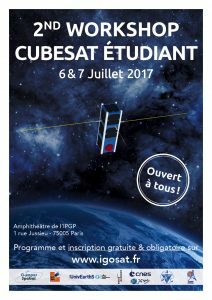 The IGOSAT team is pleased to announce the opening of registration for 2nd CubeSat Workshop student, to be held on 6 and 7 July at the Institut de Physique du Globe de Paris. The first edition in 2016 was a great success, and we wished to renew this enriching experience. This workshop aims to gather for 2 days the members of the student Cubesat community, to share their experience and progress. Experts from major laboratories and space domain institutions will be present to provide knowledge and support for these projects. Talk sessions ar scheduled for the afternoons, to offer the best possible place for discussions among participants. A convivial evening on a houseboat is organized on Thursday evening to create informal discussions in a good mood. Registration is free but mandatory: thanks to register and fulfill this form. If you have a specific topic in mind, a problem you met, an experience you want to share, or anything else related to a workshop session theme, thank you specify on the form at registration. Finally, feel free to pass the information around you, the event is open to all! The workshop is financed by Campus Spatial, organised by IGOSat and the Labex UnivEarthS. It is supported by the Université Paris Diderot, the CNES, the programme Janus, the APC laboratory and the IPGP.